You can also have a look at the whole 1918 or at August 10 across the years. Have a look at the old newspapers from 10 August 1918 and get them! Get a FREE Numerology report based on the digits of 10 August 1918! Which were the important events of 10 August 1918 ? Eugene Wilkinson: United States Naval officer, nicknamed "Dennis," who was selected for three historic command assignments. Erich Loewenhardt: German flying ace (Born 1897). Russian Revolution: The British commander in Archangel is told to help the White Russians. ...and if 10 August 1918 was your Birth Date then Join our Birthday Club! 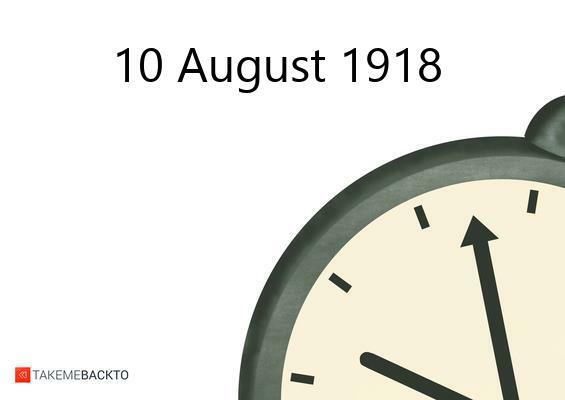 Tell the world why 10 August 1918 is such a special date for you!